911 Restoration of Kansas City Metro is proud to provide residents of both the Kansas and Missouri sides of the state line with professional mold removal Kansas City services. When you choose 911 Restoration of Kansas City Metro as your mold removal Kansas City experts, you are supporting a locally owned business who operates with integrity, honesty, and quality! 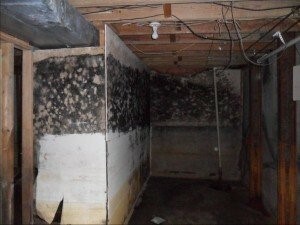 Mold growth is common in Kansas City partly due to the humid climate created by the Missouri River. While molds are always present in our natural environment, they pose health risks when elevated levels of specific mold types are present. Mold exposure can cause respiratory illnesses including from headaches and hay fever symptoms. We recommend that you call our mold removal Kansas City experts if you suspect mold in your home. Fusarium: While most types of mold prefer warmer climates, fusarium is a mold that can spread even at lower temperature. You will often find it growing on water-soaked carpet and fabrics. People with weakened immune system are particularly vulnerable to respiratory infections due to fusarium exposure. It can also cause allergic reactions and asthma attacks. Chaetomium: This mold type is commonly found on wet wood and paper products, including drywall especially after water damage. Typical allergic symptoms are similar to those of hay fever and asthma. Serpula lacrymans: With a distinct yellow appearance and the ability to causes “dry rot” on building materials, this mold is one of the worst. 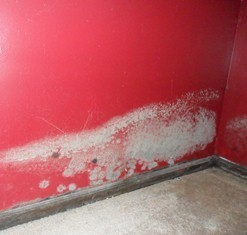 If you find this type of mold in your home, contact 911 Restoration of Kansas City Metro for mold remediation. Penicillium/Aspergillus: Commonly found on wet wood, drywall, paper products, textiles and leather, this mold can grow on many types of surfaces. Penicillium and Aspergillius can contribute to hypersensitivity pneumonia. Stachybotrys chartarum: Otherwise known as “black mold” due to its appearance or “toxic mold” due to the airborne chemical compounds it produces. It is often found on wet wood, drywall, cardboard and even ceiling tiles. This type of mold needs significant water to grow and thrive. Stachybotrys is considered to be a “toxic mold” and long exposures should be avoided without the use of proper personal protective equipment. Mold growth is a common household problem which is the reason many of homeowners attempt to handle it themselves. However, there are numerous mold types with similar appearance and odor, and it often takes a mold removal expert to identify the correct genus and recommend the proper treatment. At 911 Restoration of Kansas City Metro, we pride ourselves on being the local firm you can count on in your time of need. 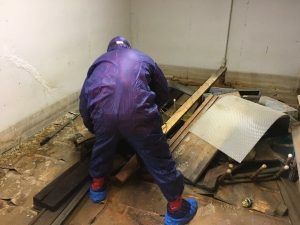 When you call for our mold removal Kansas City experts you can rest assured that one of our 24/7 customer representatives will connect you to a local mold removal Kansas City project manager promptly. Call our Kansas City team at (816)533-3072 or (913)227-4578 if you are in need of our services!